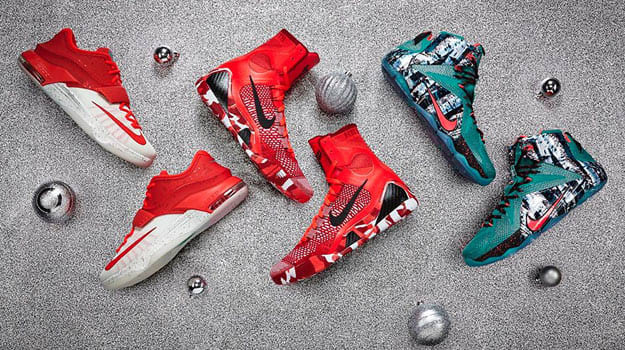 Did Kobe and KD's Absence Put A Damper on Nike's Christmas Collection? From the minute the first leaked images hit the Internet to the actual official unveiling form Nike, the hype and anticipation for the Nike Christmas collection was rabid. Yet when December 25 finally came, two of the Nike big three were sidelined for their marquee Christmas Day matchups, meaning of course, we missed out on seeing some of the most hotly anticipated shoes of the year on court. First came the news that Kevin Durant would miss his fourth straight game because of a sprained ankle. With both KD and Russell Westbrook back in the fold, the nationally televised game was supposed to be a game full of superstars, but instead the reigning MVP and his egg-nog inspired sneakers were stuck on the bench. While the game did not disappoint, the Durant-less Thunder would go on to beat the Spurs, there was still a superstar sized hole missing for those who tuned in. Just hours later, we also found out that Kobe Bryant would sit out the Lakers game against the Bulls in order to give his 36-year-old body a rest. Pretty much universally acclaimed as the premier Christma Day sneaker this holiday season, the Nike Kobe 9 Elite "Knit Stocking" never made it onto the court. Instead, we got to watch a hapless Laker team lose by 20 points to Chicago. What we&apos;re really interested in, though, are your thoughts on the Nike Christmas Collection. Mainly, did Kobe and KD&apos;s absence affect your feelings towards the sneakers? While they are still very fresh from an aesthetic standpoint, the fact that they never made it to the court on Christmas just doesn&apos;t feel right. We&apos;re sure people will still cop, but will the Kobe 9 Elite and KD7 take on the same iconic status as the Zoom Kobe VI "Green Means Go" or Zoom KD III "No Yield on Yellow" without the Christmas day performances to go with it? Somehow, Andre Roberson and Wes Johnson wearing the sneakers just doesn&apos;t have the same pull. Let us know how Kobe and KD&apos;s absence has affected your feelings on the Nike Christmas Day collection, as well as if you plan on picking up a pair or not, below. RELATED: Nike Delays the Release of the Kobe 9 Elite "What the"